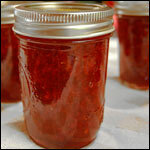 This recipe and related information come to MrBreakfast.com courtesy of The Acai Roots Company. 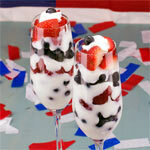 Place all the ingredients in a blender, and blend on high until desired consistency is reached. Place contents into a bowl and top with granola, sliced bananas and strawberries (or your preferred fruits) to maximize your experience. Acai is a berry from Brazil found only in the Amazon region. Due to its nutritional composition and health benefits, acai is considered to be one of the healthiest foods available for consumers. This natural berry is loaded with antioxidants, amino acids, omegas fibers, protein, and vitamins; acai is widely known for its health benefits which includes, but are not limited to: healthy cholesterol management, improvement of digestive system, sustained energy boost, and strengthening of immune system. Acai is also a source of protein, calcium, vitamins A, E, and B6. 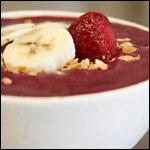 The best is that acai tastes delicious - often described as a blend of berries and chocolate. The Fruit - Acai (pronounced ah-sigh-eeh) is a Tupi (Brazilian indigene language) word that means "fruit that cries". This dark purple little fruit looks very similar a grape or blueberry (very common in the US), with the difference that the majority of the fruit is seed (95%), and only the skin around the seed is utilized to make acai juice or pulp. The acai berry scores 67% higher in antioxidants composition than pomegranate, and over 500% more than in the blueberry. 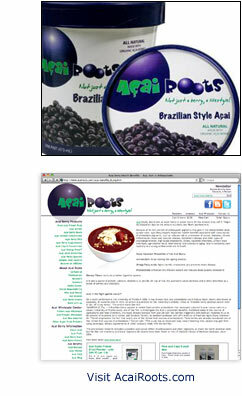 Acai Roots is a San Diego-based company that supplies Amazon-grown acai products. The company was founded in 2005 by 3 native Brazilians who, upon finding the acai available in the United Stated disappointing, decided to bring the real deal for their own consumption. What began as something targeted for themselves, rapidly expanded. As Brazilians and Americans friends tried the acai they were importing, these 3 guys started to receive orders from their own friends, and soon from the friends of their friends; and this is how Acai Roots was created. As the company began to grow, the founders continued to be committed to their original objective: "bring the delicious, authentic and healthy Brazilian-style acai to America, along with its lifestyle. "Not just the berry, the lifestyle!" 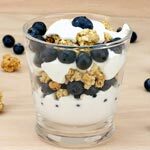 This is a perfect breakfast for spring and summer. 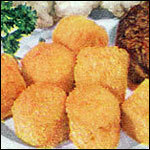 I am confident you will love it! It's not just a berry, it's a lifestyle! Mr Breakfast would like to thank AcaiRoots for this recipe. 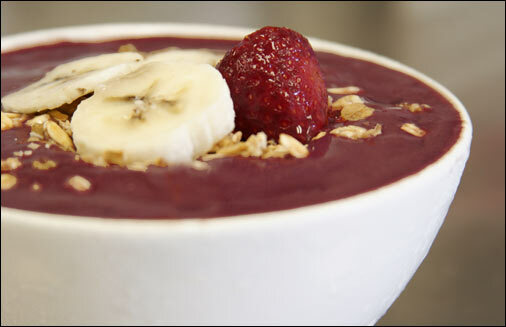 What do you think of Brazilian Acai Breakfast Bowl? Where does everyone find the frozen acai? I've been searching forever? Please help. Hmmm... isn't this just a smoothie in a bowl instead of glass? Looks good though. Love it! Healthy and delicious. I will make it again next week. Love acai. This is a pretty cool recipe. For desert sometime, try mixing acai pulp, bananas and a scoop of vanilla ice cream. That makes my favorite shake ever. 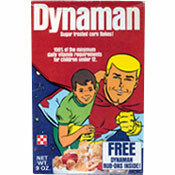 I love their site and love their product. Acai is the best for taste and energy. This was delicious, but let's face it - it's really just a smoothie in a bowl. Next time I'll have it in a glass and enjoy it more. Looks amazing. I love acai and use it for smoothies whenever we have it in the house. I love this stuff. I buy it at Trader Joes. I love it right out of the carton (after it's thawed just a couple minutes). The bowl sounds great. Will try it soon. Acai bowls are awesome! And Acai Roots definitely has the best acai in the US, I have been a fan for a long time.